There are seven different Tetris pieces which all consist of four square blocks, hence the name Tetris. During the game these pieces will appear in random order (Cultris II uses a special history-based randomizer not a "bag randomizer") at the top of your playfield and then they'll start to fall down. You are able to rotate them and move them left or right. When the piece reaches the bottom of your playfield or hits another piece on the field it stops moving and another piece will appear at the top of the playfield. You lose the game if a starting piece cannot be spawned. You can prevent this by deleting lines. If a horizontal line of your field is completely filled with parts of pieces you dropped, the line will be removed and the whole playfield above this line shifts down accordingly. The longer you play the game the faster the pieces will fall. Playing Tetris alone can be fun, but Cultris II was especially designed to be most entertaining when playing against others. Your problem won't be the speed of the pieces falling but the skill of other players, as they send you Garbagelines and you them. Garbagelines are horizontal lines of grey blocks that are inserted from the bottom of your playfield, pushing all other blocks on your field upwards, making it harder for you to survive or frankly even impossible. To give you a bit of a fighting chance, every garbage-line does have one hole in it, so you can complete them and delete these lines as well. Basically there are two ways to send garbagelines to other players. One is by deleting more than one of your own lines with a single piece placement. With the green single-line piece you can delete up to 4 lines with a single piece. Now 3 lines is not very threatening, is it? That's why there is another way to send more lines to an opponent, a lot more. Think combos. Combos are what Cultris II is all about. Every time you delete a line you will see that you get some time on your combo-timer. If you delete lines again before the time runs out your combo-counter will rise. If you delete more than one line you'll get more time. The combo-counter determines how many lines you send to your opponent in addition to the normal amount. The more lines you delete and the higher your combo-counter is, the more you'll send. The amount of additional lines you get changes with the duration of the current round. The longer a round goes on the more lines will be sent, to ensure the round will end, one way or another! The amount of additional time you get on your combo-timer depends on your current combo-counter and on the amount of lines you cleared with the last piece. An example: If your combo-counter is currently 0 and you clear 4 lines at once, you'll get 4 times the amount of additional time than you'd get from clearing just 1 line. The additional time you get will get considerably smaller the higher your combo-counter gets. So start big and stay fast and you just may have a chance! And before you ask: No, you will not get any additional bonus lines or time for stupid, unnatural T-spins! You can't choose your target yourself. Your sent lines will be distributed evenly among all other players. Fair is fair. Remaining lines will be distributed randomly among the players. If you are in a room with 7 other players and you send 17 lines, each of the opponents will get 2 lines (14) and 3 random players will each get an additional line. You probably noticed during a game or just by reading this manual that the amount of garbage you receive can be a lot more than just the 18 lines you have on your playfield, especially in a 1 on 1 game. But that doesn't mean that you can't do anything against this. You are able to block incoming lines before they even enter your playfield. Below your Combodisplay is a number. This number tells you the amount of pending lines. Garbagelines sent to you don't enter your field immediately but are delayed for a small amount of time, after that, lines will be inserted continuously during play. Whenever you drop a piece and clear at least one line, the insertion of the lines stops again and the amount of lines you would have sent to your opponents will be removed from your pending lines, any amount of sent lines that exceeds pending lines will be sent normally. This is basically a drill type of gameplay, but we are Swiss, the garbage is yellow and it has holes: THAT'S CHEESE! The first player to eat all the cheese (clears all the yellow garbage) wins. You can't send any lines to your opponents and you won't receive additional garbage, you will still die though if you reach the top... so don't! Just survive! No lines will be sent between players, but the game will insert garbage-lines automatically into all playfields. As the game progresses the garbage-lines will be inserted with increasing speed. 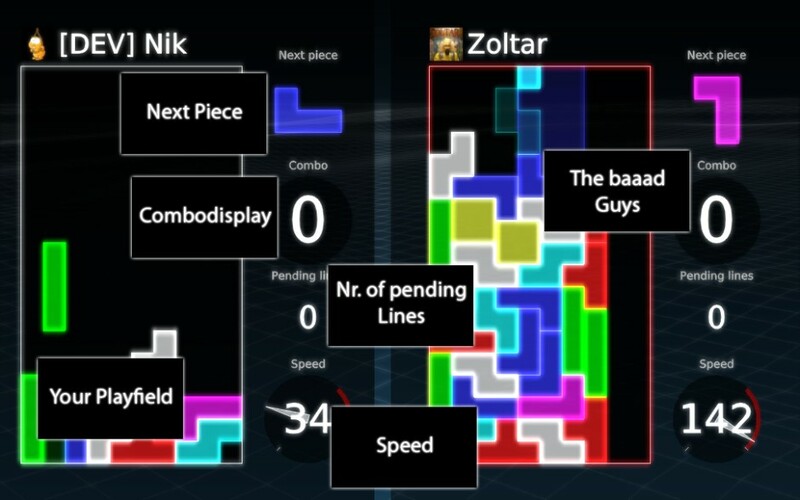 If you are a casual Tetris player, your first online experiences in Cultris II will probably be quite brutal. Due to its fast and quite unique gameplay among Tetris games, Cultris II has attracted some of the fastest players in the world. The training modes are here to help you learn and increase your skills before facing those. A series of special challenges, each designed to teach you a skill you'll need to survive the online experience and to prepare you for certain situations you'll encounter during play. Here you can set up your own game, choose the mode you want to play, add computer opponents of your desired skill level and develop your skills in the safety of offline play. Challenge a friend and beat him at the same machine. There's nothing better than to be able to look into the face of your defeated opponent after a glorious victory, don't forget to be as smug as you can be! Of course you can play as a guest on GEWALTIG.net, but we encourage you to create a profile. Your profile in Cultris II online play is the same you use here on this site. So if you already have an account for the forum here, use that one, if not click the "Create new account..." link to set one up. You can change your profile picture by clicking on it in your profile page here on this site. On the left side you will see a list of rooms, these are open games on GEWALTIG.net. Each with a name, the description of the played mode and an indicator for how full the room is. By clicking once on a room, you will open up a preview of the room on the right side, so you can decide if the skill level in the room matches your own. A double-click or a click on the "Join room" will send you into that room where you'll join the action as soon as the next round begins. If you're not happy with the currently open rooms, create your own and attract players. You can choose the name of the room, choose its game mode, limit the amount of players and decide if you want to activate team mode or not. Here you can see a list of the achievements you collected during you online play on GEWALTIG.net. Achievements can only be collected by registered players. You can also compare your achievements to those of other players. To do so just rightclick any player in the game (in the chat, his or her play field or in the player list) and choose "Compare achievements". Here you can see who has the longer... list of achievements. Here you can choose the name of the players during offline play and customize your keyboard settings. All the settings including advanced options for "Player 1" also apply to online play. For each player there is an advanced setting screen accessible trough the button below your keyboard settings. Here you can choose the starting orientation for each piece when it spawns. You can also change its color. During online play, other players will see the colors you chose for your pieces - a chance for you to show off your style! Cultris II uses the basic rotations from SRS and most of its kicks. If you feel its not working the way it should (especially for the "I", "S" and "Z" pieces), make sure you chose the correct horizontal starting positions for your pieces. Below the block options are the settings for the Keyrepeater (or "DAS"). Delay: The higher the delay the longer it takes (the longer you have to keep pressing key) before the repeater starts. It has nothing to do with the speed of the movement. Repeat speed: The higher the number the faster the piece moves. This means that delay 0 and repeat speed 9 is the fastest possible setting. The repeater starts almost immediately after you hold down the key and repeats that movement at a very high rate. Delay 9, repeat speed 0 is extremely slow. It takes ages before the repeater kicks in, and the pauses between movements are very long. Another example for you to try out is the setting delay 9, speed 9: Now if you press a key nothing happens for a pretty long time (a bit more than 100 ms) except the initial movement. Then suddenly the repeater kicks in and moves the piece very fast. Basically it's the same system windows uses when you open the keyboard properties. You can test your settings by clicking the "Test" button. Both settings are based on time, not frames.